Today, the U.S. pauses to remember one of the greatest people in our modern history, the Reverend Dr. Martin Luther King, Jr. His work to inspire and organize civil rights warriors changed the path of our country and bettered the lives of countless Americans living during his time and moving forward. The Internet wasn’t a thing in 1963, and we wonder how such a tool might have changed his work. He passed many years ago, but he’s still able to use the Internet as a tool to spread his message. Today that message of ending division seems just as relevant. 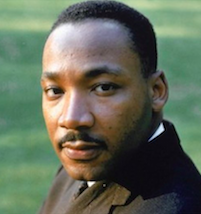 In honor of Dr. King, the people who marched with him, those who continue to work to advance civil rights and social justice today, we want to share the full audio of his “I Have A Dream Speech” from August 28, 1963. If you’d like to read the speech, you can access it in the National Archives.